Acidic water is, by definition, any water with a pH of less than 7.0. Water that is low in pH can have undesirable effects on plumbing fixtures and piping. Green staining of fixtures is a common indication of acidic water. Copper pipe can be ruined by water low in pH. Low pH is also an issue in water treatment. Sometimes it is necessary to raise the pH of acidic water in order for other treatment strategies to apply. For example, oxidizing iron to prepare it for filtration is difficult if the pH of the water is low, so raising the pH of the water is often the first step in removing iron from well water. Almost all water treatment issues involve pH in some way. Water constituents change in nature as pH changes, so many treatments can be applied only if pH is within the desired range. There is no evidence that drinking water low in pH has any negative effect on health. 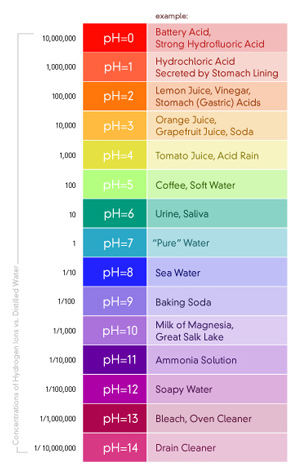 Taste, of course, can be an issue if the pH is very low. We offer product links with more information about calcite filters or soda ash feeders.